A majority (55%) of Latino registered voters believe that Obama is better for Hispanics. In contrast, just 11% believe that McCain is better for Hispanics and 29% say there is no difference between the two candidates. Hispanics who are dissatisfied with the country’s direction are more likely to believe that Obama is better for Latinos (62%) than are Hispanics who are satisfied with the country’s direction (40%). Those who are following the presidential race closely are also more likely to believe that Obama is better for Latinos than are Hispanics who are not following the presidential race closely, 57% compared with 46%. Within demographic categories, there are few large differences on which candidate is perceived as better for Latinos. However, men are more likely than women to say that Obama is better for Hispanics—60% compared with 50%. 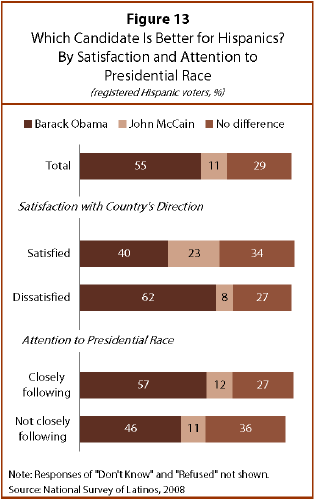 Most Hispanic registered voters also believe that Obama is better for immigrants (50%), while just 12% believe McCain is better and 32% who say there is no difference between the two candidates. As with which candidate is better for Latinos, there are few differences within demographic categories. More than half (55%) of all Latino registered voters say that the Democratic Party has more concern for Hispanics, while just 6% say that of the Republican Party and 35% say there is no difference between the two parties in their concern for Hispanics. Catholics (59%) are more likely to say that the Democratic Party has more concern for Latinos than Latinos who identify with a non-Catholic religion (45%). Non-Catholics (42%) are more likely to say that there is no difference between the parties than are Catholics (32%).